All our models are based on our flexible tree, that is successfully approved for the last 8 years. The tree is made of a special polyurethan that gives us exactly the degree of flexibility, we require to fit the saddle perfectly to different horse backs. Straigther or more curved, we can adapt on both. The tree is re-inforced with steel springs to absorb and distrubute the riders weight optimally. The tree is not a fulltree but half-tree with traditionally girthing which provides a lot of comfort to the rider and the elasticity protects the horses back. The seat is modeled on the tree with a very expensive foam that maximizes the comfort of the riders. Women appreciate the seat as well as men. The panels are sandwich-panels, which means the consist of different layers. 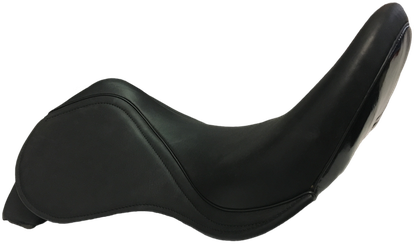 From the outside we have the super soft leather, then the same foam that you know from the seat and finally synthetic wool. We use synthetic wool as it is not as sensitive to the surrounding like natural wool. The panels are easy to re-flock. 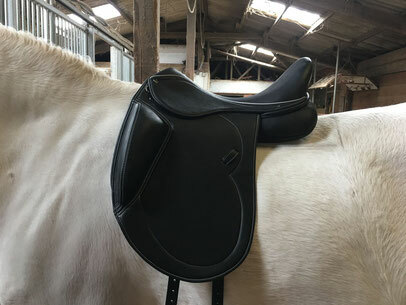 We provide standard panels and a plus panels that has 2 cm more filling height in the back part which is perfect for all horses with a very straight back. We also offer a very smart girthing system consisting of 2 parts. Part one is the double V- girthing that avoid puncutal pressure and spread the girthing to a wide area. BUT we do not attach the girthing to the gullet, since this would limit a lot the rotation of the tree in front and therefore bothers the shoulder on their way backwards under the saddle. Part 2 is the very nice system to lead the girth straps through at the end of the flap. 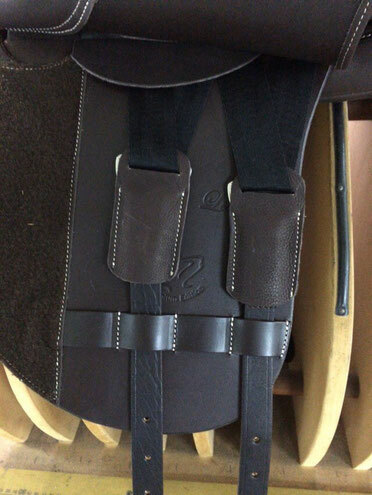 This special loops helps us to adapt perfectly to the horses girth position. For a horse with a forwarded girth position we can use loop nr. 1 and 3 or 2 and 3 and for a horse that is making the saddle too busy in the back, we can use nr. 3 and nr 5 for example. 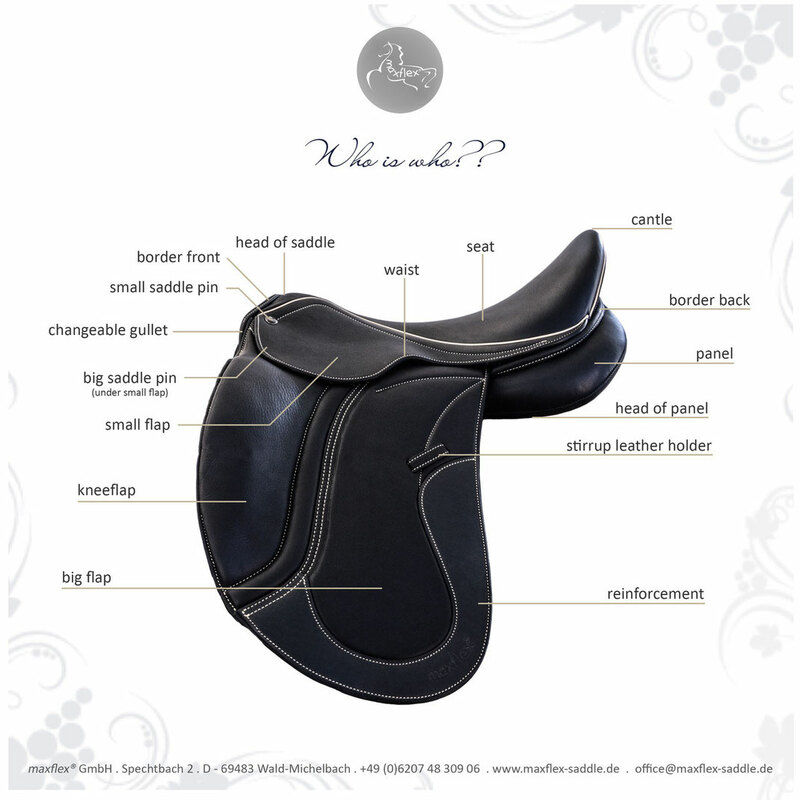 So we have a nice and very horsefriendly way to customize this important part of the saddle. Our spine channel is per standard 6 to 7 cm wide, but can be customized in case you need. But be careful, too wide is not good for the horse as the wider it is the smaller gets the area where the horse is carrying the weight, since the contact area on the longissimus then gets smaller when we widen the channel. Also consider that the "legs" of the tree must lay on the panels. So if you want to sit slim and therefore we have a slim waist in the tree, we have to adapt the panels according to that. Normally a spinne channel of 5 to 7 cm is more than enough. In extra wide cases, we can widen. 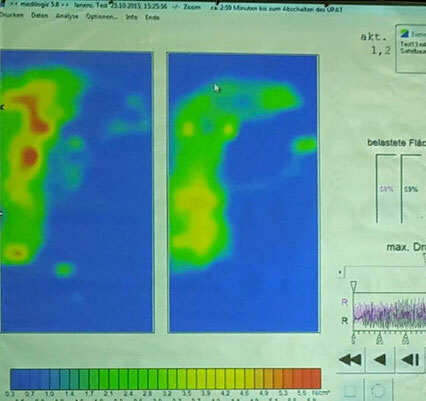 Our saddle was the winner in an independant pressure point measurement where they measuerd and compared the pressure that arrives at the horses back. We had 2 horses with 2 riders and in total 14 saddles to test. 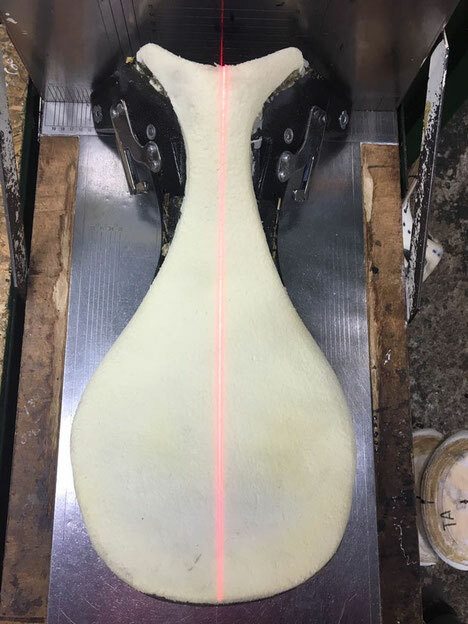 The maxflex showed the best results of all brands tested there. You can see that on the right there is no single pressure point and that the shoulder is perfectly free. The rotation of the saddle head is responsible for that super result. Our saddles also provide a huge and wide contact area on the horses back but never going over the longissimus at the 18th rip. 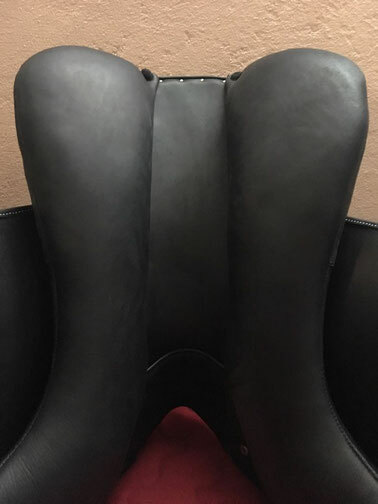 maxflex on the right in comparison to another saddle on the left.